Can We Talk About the Sad Stuff? Hey, you wanna talk about grief? No? Didn’t think so. Let’s face it: Nobody wants to talk about the utter misery of losing someone, or something, dear. We don’t want to see other people grieve, and we certainly don’t want to unleash our own sadness on those around us. Better to keep those feelings tucked away until they fizzle out. It’s easier that way, isn’t it? 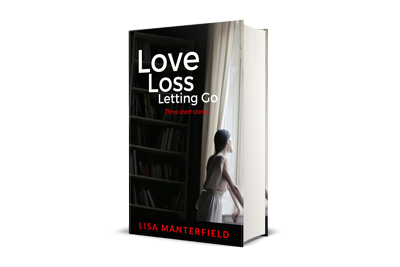 The trouble with grief is that it accumulates, and even small losses, like a missed promotion, a broken friendship, or an unanticipated change of address can start to take their toll on us. 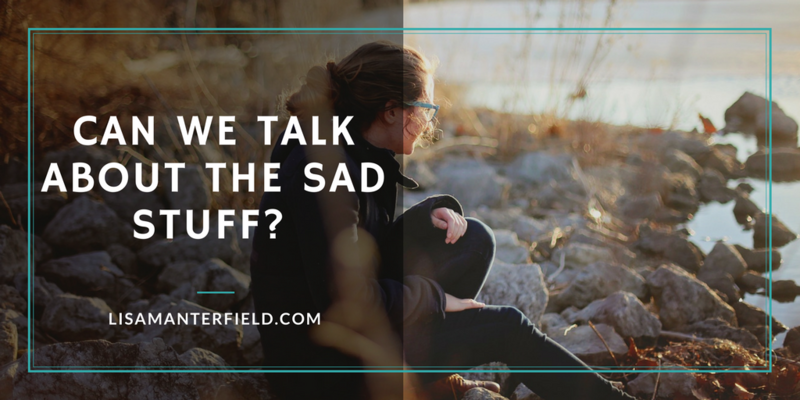 So, please can we talk about why we need to deal with grief, and what happens when we pretend that everything’s okay? Grief is unpleasant and exhausting, but it’s also an essential part of the healing process. It helps us to keep moving forward, to keep living. And it enables us to come to terms with a new kind of life and find meaning again, even when neither of those things seem possible. It doesn’t force us to get over our loss, but it does help us to get through it. In many cultures and religions, active mourning and expression of grief are encouraged. Many Middle-Eastern cultures believe that crying cleanses the soul, and wailing and demonstrative weeping is not merely accepted, but expected. In some African countries, it’s not uncommon for communities to send off their dead in a party-like atmosphere of music and dancing. Many religions and cultures observe periods of official mourning, during which the bereaved are expected to be fully engaged in the process of grieving. In Judaism, the grieving “sit Shiva” for seven days; in Islam, the bereaved are never left alone; and in Romani culture, they are forbidden to cook, wash, or shave, so that they can immerse themselves in mourning. 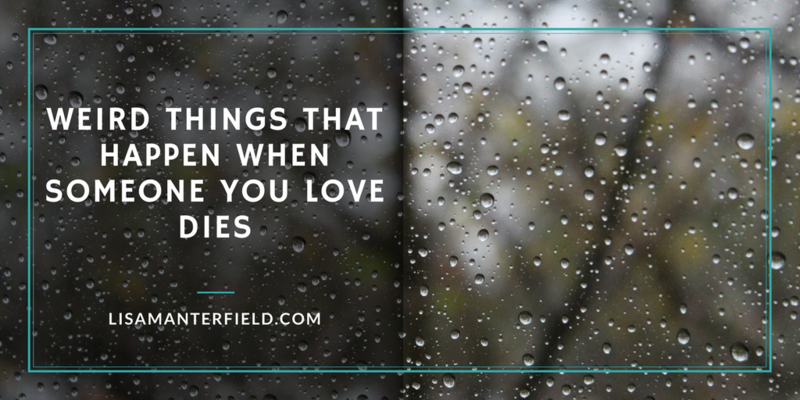 These traditions can seem strange when compared to the quiet funerals and controlled grieving many of us have been raised with, but there is great value in an official and socially acceptable period and method of mourning. It creates a container for grief, an outlet for emotions, and the impetus to get out of the container and move on. After a year of enforced and concentrated mourning, I think most of us would be ready to get out into the world and start living again. Unfortunately, many of us live in societies where grief makes people uncomfortable and there is no room for active and demonstrative shows of emotion. This is especially true when you’re mourning an intangible or misunderstood loss, or something that well-meaning people think you ought to easily “get over.” So, instead of expressing our grief, we hold it inside and go about our lives while trying to pretend that everything is okay. We avoid the topic and we don’t tell people who care about us what we’re going through. We stuff grief away and put on brave faces because it’s easier to pretend than to risk letting our sadness show to someone who doesn’t understand. The problem with stuffing grief into a box and sitting on the lid is that the grief doesn’t just go away. It builds up inside us until it finds an outlet. Then, life offers social events, work obligations, and well-meaning comments from strangers (e.g. “Aren’t you over that yet?”), and our grief takes control over us and erupts in humiliating public breakdowns. Even when we think we have our feelings under control, it has a tendency to squeeze its way out any way it can. It’s what my friend calls “grieving sideways”. You find yourself picking fights and getting disproportionately upset with people over things that wouldn’t normally faze you. And while a stranger who cuts you off in traffic or a neighbor with a yapping dog might get an unwarranted dose of anger, more often than not it’s those closest to us—family, friends, and partners—who bear the brunt of our outbursts. What’s more, instead of acting as a pressure relief valve, these outbursts compound our grief. We behave badly and then we add shame and frustration on top of our grief, and before you know it, it’s a hot mess. So, it’s critical to deal with your loss now, even though it’s raw and more painful than anything you could have imagined. Unfortunately, the only way to the other side of grief is through it. Allowing yourself a period of mourning—whether that’s a day in bed or a week off work—can go a long way to starting the healing process. It’s okay to feel miserable. It’s okay not to be brave or even to have decorum. It’s okay to wallow in sadness, as long as you also commit to a timeframe. After that, you have to get up, take a shower, and take the first step back out into the world again. Grief is a big, messy jungle of emotion that we’d all sooner avoid, but in the end, going through it makes for a much shorter journey than trying to go around it. 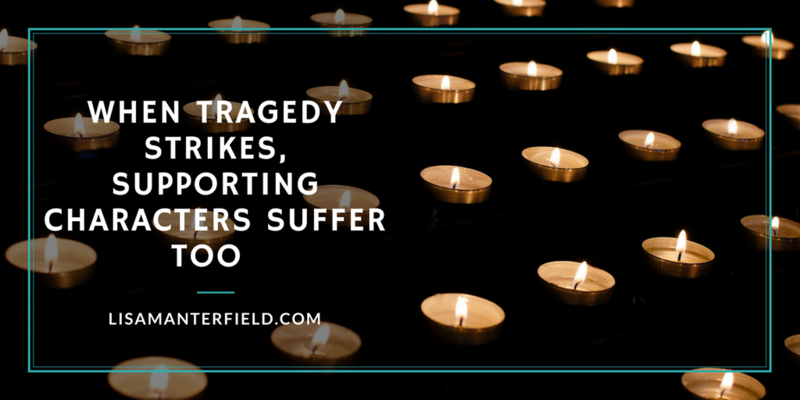 Over the past couple of weeks, the threat of tragedy has set many people on edge. First Harvey swept into Texas, then Irma battered the Caribbean and headed for Florida. Meanwhile, Jose and Katia built, bringing more uncertainty of what they would become or where they would go. People in the direct path of the storm faced the very real possibility of tragedy. They stood to lose their homes, livelihoods, pets, and even their lives. Many were called upon to tap into reserves of strength and courage to get through a situation for which they had little time to prepare. Meanwhile, many of us outside the danger zone could only watch and wait. Although I didn’t have anyone close to me directly affected by the storms, my social media feeds were full of posts from friends who did have loved ones in danger. Lots of people were afraid of what might happen, but felt powerless to do anything about it. That kind of stress can have a huge emotional toll. I thought a lot about the effects of powerlessness while writing The Smallest Thing. On the pages of the main story, Em finds herself stuck in the middle of an unimaginable tragedy that she is completely unprepared to handle. She does what any of us would do, which is to figure out how to survive. She doesn’t always make the best choices, especially at first. She has no role models or experience to call upon, but she does what she has to, and then she does what she needs to do. She finds her inner strength and a side of herself she never knew existed. And while she thinks she is powerless, she finds ways to take action. Meanwhile, in the fictional world beyond the book, Em’s mother and little sister Alice experience the powerlessness that many of us felt last week as Hurricane Irma barreled towards our loved ones. Although their story isn’t told in the book, I’ve imagined them watching helplessly as Em and her father fought for survival. I imagined that Em’s mother, like many us last week, would carry enormous guilt that she had gone to visit her sister and so had avoided being swept up in the quarantine. She’d feel helpless because there would be nothing she could do to protect her loved ones. She’d be terrified and probably frustrated that she didn’t know, at every second of the day, what was happening to them. She’d have moments of fury when others judged her actions or those of her loved ones, without full knowledge of the situation (hello, social media haters) and perhaps relief when one kind person asked how her family was doing and how she was holding up. In fiction, and in our real-world tragedies, the stories of the supporting characters aren’t generally the ones that keep us riveted. But if you were a supporting character in the recent news headlines, you know, like Em’s mother, that you have your own story, too. It’s hard to believe that 20 years have gone by since the death of Princess Diana. It’s one of those moments that I remember exactly where I was when the news broke. I was in the kitchen at the restaurant where I worked as a server when the host came running in to share the news that she was dead. I remember thinking he’d lost his mind, as there was no way someone so young, vibrant, and such a huge part of popular culture at that point could be gone. But she was. In an interview earlier this year, Prince Harry opened up about dealing with—or rather not dealing with—his grief after his mother’s death. “My way of dealing with it was sticking my head in the sand, refusing to ever think about my mum, because why would that help?” he told The Telegraph’s Bryony Gordon in the first episode of her new Mad World mental health podcast. Prince Harry was only 12 when his mother was killed in the infamous car accident in Paris. As I listened to his very frank interview about how he suppressed his grief and refused to seek help, even as it affected his personal and professional life, I couldn’t help but think about Kat and how her inability to work through with her grief affected her decisions. During some early readings of the manuscript for A Strange Companion, a couple of people asked me why it had taken Kat so long to deal with the deaths of Gabe and her father. Hearing Prince Harry talk about ignoring his grief for almost 20 years reminded me once again that grief is a long and messy process that is different for each of us. It takes as long as it takes. That said, ignoring grief doesn’t make it go away. It’s this idea of speaking out that is behind the Heads Together charity the prince had founded, alongside his brother William and sister-in-law Kate, to help raise awareness and break the stigma surrounding mental health issues. You can hear the full interview with Prince Harry here, and find out more about his charity work at https://www.headstogether.org.uk. It takes the brain a long time to process the idea that someone who has been there since the moment of your birth is suddenly gone. Every time the phone rang or there was an unexpected knock at the door, my first thought was always, “Oh, it’s my dad.” My adrenaline would start flowing and it would take several seconds for my grief-addled brain to catch up and realize that it couldn’t possibly be him. The experience was worsened when, on the day of my dad’s funeral, I answered the door to find him standing there. It took me a lot longer than a few seconds to realize that the man on the doorstep was my dad’s younger brother, who’d I never met in person and who happened to bear an uncanny resemblance. It’s a wonder the shock didn’t kill me. And speaking of flippant expressions like “It’s a wonder the shock didn’t kill me”, only when someone you love dies do you realize how often people use death-related expressions in daily life. “Don’t have a stroke”, “The good die young”, and “It’s like a cancer” all take on a different meaning when they happen to your loved one. “I almost had a heart attack” was an expression used often by many of my friends, but it stung like hell to hear it after my dad actually did have one. It’s been over 30 years since my dad’s death and I still have the travel alarm clock he woke up to every morning. It doesn’t work and I don’t even keep it on display, but I will never part with it. Same goes for the monogrammed handkerchiefs into which he always blew his nose. My dad won trophies for running and was an avid gardener, but it’s the clock and the hankies that suddenly became significant. In my collection of worthless, but priceless, treasures, I have costume jewelry brooches from each of my grandmothers and a miniature ceramic teapot that belonged to my auntie. These items have become hugely significant to me. You think about your loved one all the time in the weeks after their death. You’ll probably talk to them a lot, too. Then one day, as you’re walking down the street, you’ll recall a fond memory and in that instant, the sun will peek out from behind a cloud and shine on you. And you’ll know, I mean absolutely know without a doubt, that it’s a sign that your departed is thinking about you. About six months after my dad passed away, my mother and I adopted our first cat. The cat had been abandoned, taken in by a relative of my friend, but hadn’t settled with the cats she already had. My friend couldn’t take the kitten, and so by a series of random events, Smudge came into our lives. One day, Smudge looked at me in a way that made me speculate if he could be the reincarnation of my dad. Crazy, right? Perhaps, but the possibility gave me a lot of comfort. The dead never age. My mother is almost 85 now. She has white hair and her body has lost its strength. But my dad will always be young and vibrant, his body lean and strong from running, and his face slender and tanned. For a long time, I couldn’t shake off the images of the last time I saw him on the night he died. But over time, I replaced those with fonder memories of him at the beach or walking in the hills. I’m no longer sure if I remember him this way in real life or just from the photographs I have. But I do know that there were days when I woke up and could not remember what he looked like. Those were terrible moments, filled with panic. But they passed because you never really do forget. Losing someone you love changes you forever. 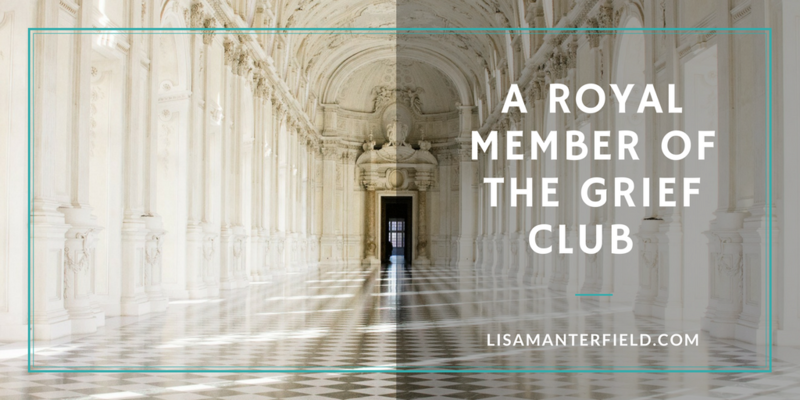 You immediately feel like you don’t fit in, that you are the sole member of a club that even your closest friends aren’t eligible to join. Eventually, you learn to live without your loved one, you get on with your life, and you even love other people. You don’t drag around your grief forever. But you never really get over losing that person. You always have a little hole in your soul that no one else can ever fill. But somehow you learn to live around it.